After posting a couple of pictures on Twitter of the small power supply I'd built for PocketQubes, I thought I'd give a bit more detail in a blog post. Even though I'm building a different EPS (electrical power system) for my PocketQube "OzQube-1", I wanted a small power supply that could power the satellite while I am testing it. It needs to be able to be powered from a plug pack (wall wart) or from an external battery pack. There is actually a very common thing that already fulfils most of these requirements - the humble breadboard power supply! The main issue is that they don't fit inside a PocketQube. Fortunately, I have a prototyping solution that's already in the PQ60 PocketQube form factor - ProtoQube. All that's needed now is a few components. 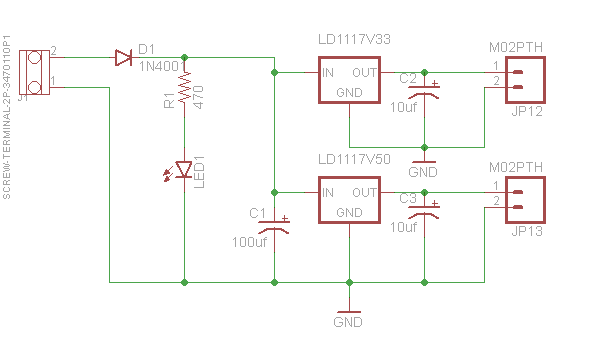 If you look at a breadboard power supply, they often have a DC jack, and a USB input. The problem with USB is that there's often a 500mA current limit. This wasn't going to work for me, so I opted for a 2 pin screw terminal input. Another issue with a breadboard power supply is the the voltage regulators. These are often SOT-223 surface mount parts. This is ok for a custom made power supply, but ProtoQube has a grid of holes, so a through hole regulator is needed. In order to keep the component count down, I went with fixed value voltage regulators. There are many on the market, so I went with some that were readily available - the ST Micro LD1117V50 and LD1117V33. These just need a single bypass capacitor on the input and output, and are capable of 800mA current. Assembling the power supply just requires some additional solid core wire, and the components arranged like you see in the pictures. All that's needed now is to solder on the Hirose FX8C backplane connector, and some female pin header sockets so I can connect the power supply output to the rest of the stack!